Following detailed research and consultation carried out last year and further to having produced this rough design draft, Lightworks are extremely pleased to have received confirmation that this highly challenging bespoke stained glass project can now go ahead. Based in a prominent coastal front residence in the North West of England, our clients original brief was to come up with a design concept for a large (900 x 1500mm) scale stained glass window that reflected their location. Taking a nautical/marine theme as a starting point, and having expressed their love for Lightworks representation of “The Green Man“, the idea of using Neptune, the Roman counterpart of the Greek God Posiedon, was proposed and quickly accepted. Our stylized proposal, produced quickly in pencil, shows Neptune as he is traditionally portrayed; an older bearded gentleman. 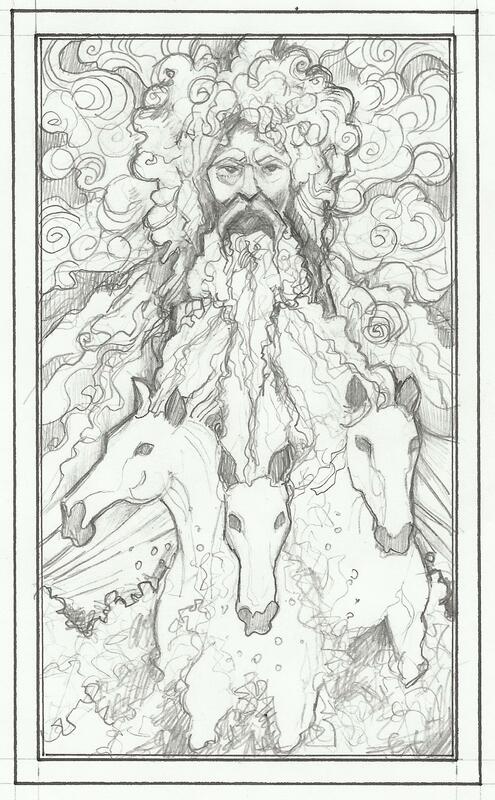 Surrounded by the crashing foaming waves of the sea, he is seen looming above three galloping white stallions, a reference to his secondary worship as the God of Horses. The window, to be built in the traditional leaded manner, will be produced using a selection of beautiful hand-made, mouth-blown cylinder glass and will make extensive use of heavily painted and kiln fired detailing, coupled with highly challenging areas of acid etching. With the next stage of the commission process being the production of a large scaled and fully coloured client presentation design, we will be posting regular project updates at every stage. We are also extremely pleased to once again have Patrick Walsh on board who will be recording the entire creative process from start to finish in a series of films.